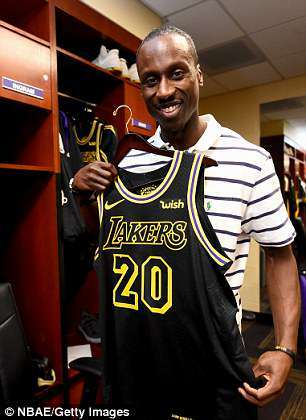 After 10-years in the NBA development league and a record 713 three-pointers made, 32-year-old Andre Ingram became the NBA’s oldest American rookie since 1964 on Tuesday night, and he did it while dropping 19 points for the Los Angeles Lakers against the NBA’s top team, the Houston Rockets, in his debut. The Lakers surprised the veteran point guard last week by moving up his ‘exit interview’ from the G League’s South Bay Lakers and having president of basketball operations Magic Johnson and general manager Rob Pelinka on hand to present him a new contract and congratulate him. The team posted video of the moment on Twitter. The married father of two daughters has a degree in physics from American University and sometimes serves as a math tutor. So when he called his wife back home in Virginia to tell her about his promotion, she wasn’t expecting any major news about the NBA. ‘I thought he was calling to tell me when he was coming home, but when he said he was being called up to the Lakers I literally lost it and started screaming,’ his wife Marilee said Tuesday. ‘And was just very emotional. I am so thankful for this opportunity that you guys have given him. 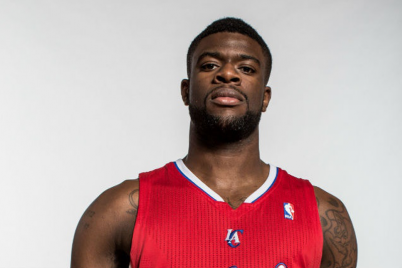 This NBA star didn’t want his transgender sister at his games. Then he lost her.